I was really kindly invited by Laura Cooper’s New England Photo Blog to take part in a five day black and white photo challenge. 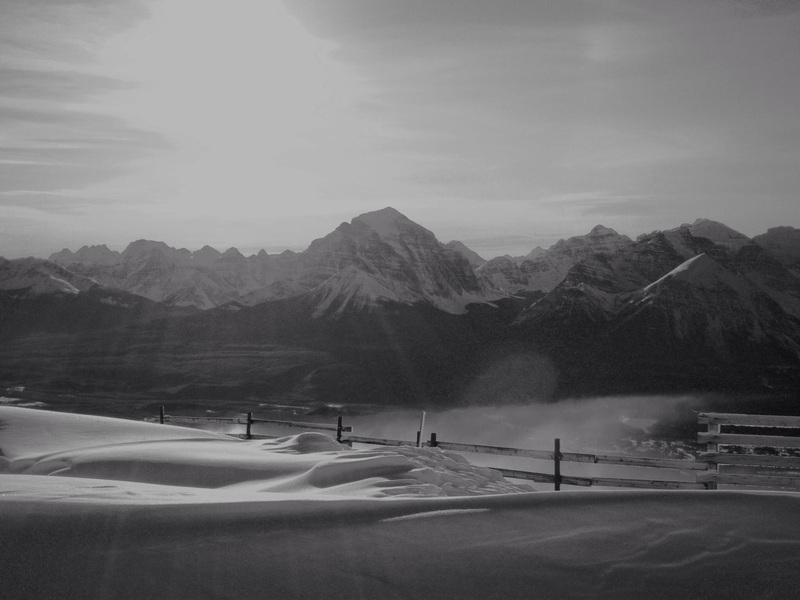 Today is the first day, and my photograph is of the snow fences at Lake Louise Ski Area. I took this quite a while back (I think about 2009 or 2010), with my point and shoot camera. I love the way the snow forms around these structures creating unique drift shapes. I love skiing at Lake Louise, it is such an incredibly beautiful ski area so it is always useful to keep a camera to hand when skiing there. One of the most incredible views there is of Mount Temple, which is the biggest mountain at the back of the photograph behind the snow fences. It’s also an aspiration. I’ve been looking at Mount Temple for quite a few years now, and I am really keen to hike it.. I think this year is finally the year for doing it. So hopefully in a few months time I’ll have a post on it for you all to read! As part of the challenge you nominate a blogger friend each day to join in and take part. So today I nominate Living at the Foot of the Rockies, which is a really great blog about Inger and her husband’s adventures and travels. They have a really great series of posts about their trip to Alaska at the moment. Lovely photo – lovely area! I’m on the hill today – lovely day off! So pretty! I haven’t been skiing in far too long! Stunning photo in black and white. It looks so peacefuly. Serene. The shadows in the snow are truly striking in black and white.